The information contained in this catalog is the most accurate available at the time of publication, but changes may become effective before the next catalog is published. It is ultimately the student’s responsibility to stay abreast of current regulations, curricula, a nd the status of specific programs being offered. Further, the university reserves the right, as approved by the Board of Regents, to modify requirements, curricula offerings, and charges, and to add, alter, or delete courses and programs through appropriate procedures. While reasonable efforts will be made to publicize such changes, a student is encouraged to seek current information from appropriate offices. South Dakota State University has a well-established commitment to maintaining a campus environment free from discrimination and harassment, as articulated by federal and state law, and University policy. It is the policy of SDSU not to discriminate on the basis of race, color, creed, religion, national origin, ancestry, gender, transgender status, marital status, pregnancy, sexual orientation, age, disability, veteran’s status or any other protected class in the offering of all benefits, services, and educational and employment opportunities. As part of this policy, SDSU has designated a Title IX/EEO Coordinator to assist individuals with any concerns about discrimination or harassment in education programs or activities. 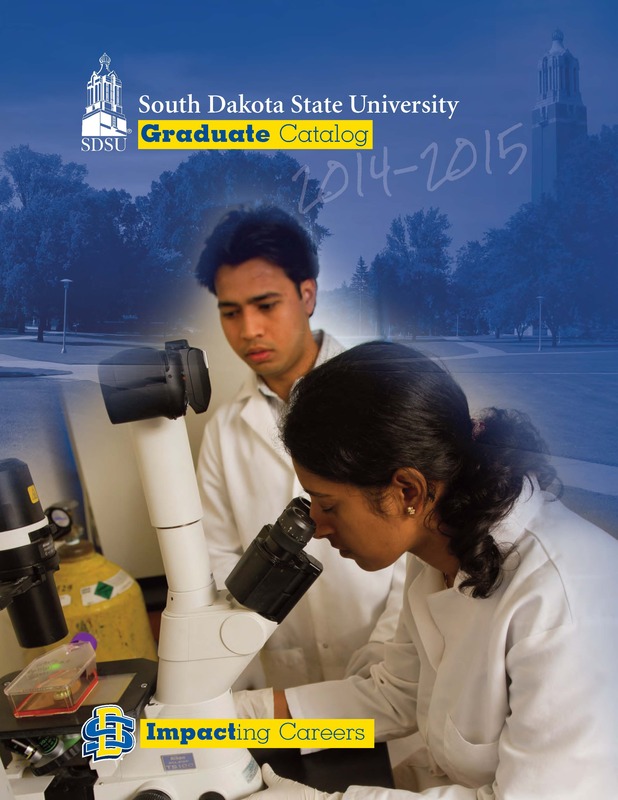 These polices can be found at http://www.sdstate.edu/policies/. Complainants, respondents, witnesses, and other persons who have assisted, testified, or participated in any manner in any phase of a harassment or discrimination investigation will be protected against retaliation. SDSU’s policy and applicable Board of Regents, state and federal regulations prohibit retaliation, coercion, interference and/or intimidation, or any other adverse action taken as a direct result of a complaint being brought forth. All concerns are responded to and/or investigation in a highly sensitive manner. The privacy of the parties involved is protected. The process is neutral, impartial and fair. Approach the person you feel has discriminated against or has harassed you and communicate your concern directly, in person or in writing.Ask them to stop the concerning behavior or comments immediately. Report harassment or discrimination to the Title IX/EEO Coordinator. To report your concerns, you are welcome to speak directly to the Title IX Coordinator. If a student or employee confides in you their concern, please encourage them to report the issue or you may report on their behalf. The University has a legal obligation to respond to issues, big and small, so SDSU requests that all concerns be brought forth. The University has many resources and wants to support faculty, staff and students. What happens if a violation of the policy occurs? The University will not tolerate discrimination, harassment or retaliation that violates SDBOR or University policy. Where such violations are investigated and found to have indeed occurred, the University will take steps to end it immediately. An individual found to have engaged in discrimination, harassment or retaliation will be subject to appropriate discipline, depending on the severity of the misconduct.